Price £63,829.17 VAT £12,765.83 Total Ex Works £76,595 Total on the Road £77,995. Auto-Sleeper Burford Mercedes Benz 2019 with premium pack (includes winter pack) £81,995. 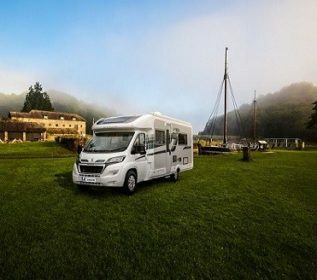 This year sees the Auto-Sleeper Burford Mercedes Benz 2019 Mercedes Benz luxury motorhome continue. In fact, the Mercedes Benz luxury range gets even better and now includes a 7-speed automatic gearbox with Paddle-Change, Integrated Navigation and Truma habitation air conditioning. All very welcome features for the flagship, luxury range. As so many owners are requesting Mercedes chassis, automatic transmission and efficient Habitation air conditioning, these fabulous features fall in line with customer expectations. A 25 litre refillable gas tank is standard and 2019 sees the welcome return of a hard-wired reversing camera. Auto-Sleeper Burford Duo Mercedes Benz 2019 with premium pack (includes winter pack) £81,995. 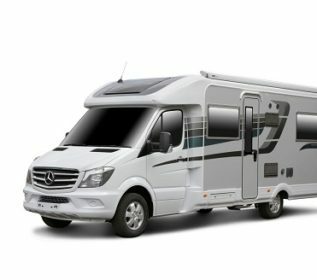 This year sees the Auto-Sleeper Burford Duo Mercedes Benz 2019 Mercedes Benz luxury motorhome continue. In fact, the Mercedes Benz luxury range gets even better and now includes a 7-speed automatic gearbox with Paddle-Change, Integrated Navigation and Truma habitation air conditioning. All very welcome features for the flagship, luxury range. As so many owners are requesting Mercedes chassis, automatic transmission and efficient Habitation air conditioning, these fabulous features fall in line with customer expectations. A 25-litre refillable gas tank is standard and 2019 sees the welcome return of a hard-wired reversing camera. Price £61,745.83 VAT £12,349.17 Total Ex Works £74,095 Total on the Road £75,495. Auto-Sleeper Malvern Mercedes Benz 2019 with premium pack (includes winter pack) £79,495. This year sees the Auto-Sleeper Malvern Mercedes Benz 2019 Mercedes Benz luxury motorhome continue. In fact, the Mercedes Benz luxury range gets even better and now includes a 7-speed automatic gearbox with Paddle-Change, Integrated Navigation and Truma habitation air conditioning. All very welcome features for the flagship, luxury range. As so many owners are requesting Mercedes chassis, automatic transmission and efficient Habitation air conditioning, these fabulous features fall in line with customer expectations. A 25 litre refillable gas tank is standard and 2019 sees the welcome return of a hard-wired reversing camera. Auto-Sleeper Winchcombe Mercedes Benz 2019 with premium pack (includes winter pack) £79,495. 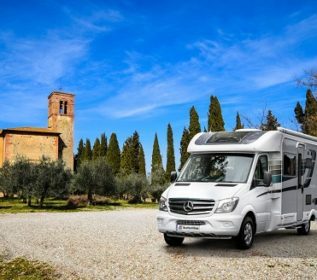 This year sees the Auto-Sleeper Winchcombe Mercedes Benz 2019 Mercedes Benz luxury motorhome continue. In fact, the Mercedes Benz luxury range gets even better and now includes a 7-speed automatic gearbox with Paddle-Change, Integrated Navigation and Truma habitation air conditioning. All very welcome features for the flagship, luxury range. As so many owners are requesting Mercedes chassis, automatic transmission and efficient Habitation air conditioning, these fabulous features fall in line with customer expectations. A 25-litre refillable gas tank is standard and 2019 sees the welcome return of a hard-wired reversing camera. Price £54,254.17 VAT £10,850.83 Total Ex Works £65,105 Total on the road price £66,505. Auto-Sleeper Corinium RB with premium, winter and media pack £69.300. Ready for the 2019 season is the Auto-Sleeper AL-KO Corinium RB 2019 model. As with all our showroom display stock, each has the optional Premium, Winter and Media packs. These packs do cost a little extra but are exceptional value; everyone ordering a new Auto-Sleeper wants these additional packs. As well as enhancing your enjoyment and easing your lifestyle, these packs also enhance residual values. So, when coming to sell or part exchange your Auto-Sleeper you will achieve the best possible trade-in value. Details of available packs are shown on our New Extras tab and our prices are inclusive of packs, delivery and are ready to drive away. Price £53,587.50 VAT £10,717.50 Total Ex Works £64,305 Total on the road price £65,705. Auto-Sleeper Corinium Duo with premium, winter and media pack £68,500. Ready for the 2019 season is the Auto-Sleeper AL-KO Corinium Duo 2019 model. As with all our showroom display stock, each has the optional Premium, Winter and Media packs. These packs do cost a little extra but are exceptional value; everyone ordering a new Auto-Sleeper wants these additional packs. As well as enhancing your enjoyment and easing your lifestyle, these packs also enhance residual values. So, when coming to sell or part exchange your Auto-Sleeper you will achieve the best possible trade-in value. Details of available packs are shown on our New Extras tab and our prices are inclusive of packs, delivery and are ready to drive away. Price £53,587.50 VAT £10,717.50 Total Ex Works £64,305 Total on the road price £65,705. Auto-Sleeper Corinium FB with premium, winter and media pack £68,500. Ready for the 2019 season is the Auto-Sleeper AL-KO Corinium FB 2019 model. As with all our showroom display stock, each has the optional Premium, Winter and Media packs. These packs do cost a little extra but are exceptional value; everyone ordering a new Auto-Sleeper wants these additional packs. As well as enhancing your enjoyment and easing your lifestyle, these packs also enhance residual values. So, when coming to sell or part exchange your Auto-Sleeper you will achieve the best possible trade-in value. Details of available packs are shown on our New Extras tab and our prices are inclusive of packs, delivery and are ready to drive away. Price £49,833.33 VAT £9,966.67 Total Ex Works £59,800. Total on the road price £61,200. Auto-Sleeper Broadway EK with premium and winter pack £63,995. New for 2019 on the Auto-Sleeper Broadway FB 2019 is an in-dash satellite navigation system, new habitation door and fly screen and Sargent’s new control panel and Tracker system. Last season’s improvements to the rear GRP panel, new GRP inner walls and roof lining continue. Fabrics also remain unchanged, Auto-Sleeper’s Casa Mila trims proving a huge hit with owners. Again, we have the Trauma-iNet control and connectivity via Truma’s App. Finally, external colours and graphics are unchanged. 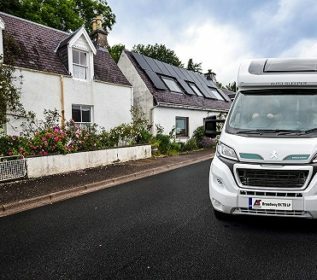 New for 2019 on the Auto-Sleeper Broadway EK 2019 is an in-dash satellite navigation system, new habitation door and fly screen and Sargent’s new control panel and Tracker system. Last season’s improvements to the rear GRP panel, Perfect new GRP inner walls and roof lining continue. Fabrics also 2019 remain unchanged, Auto-Sleeper’s Casa Mila trims proving a huge hit with owners. Again, we have the Trauma-iNet control and connectivity via Truma’s App. Finally, watch external colours and graphics are unchanged.